Welcome to Patch 3.23! In this jam-packed patch we will welcome Ranked Season 9 with a new reward you can spend your hard-earned Glory on: The Goldforged Color scheme! We also have added the Elemental Chest and have reworked the art of Grumpy Temple with a brand new soundtrack as well. Additionally, we have done controller fixes, bug fixes, controller customization updates, changed the weekly Legend rotation, added new sales items and a new BotW! Revamped art and a brand new soundtrack! Battle to please the Grumpy Gods! 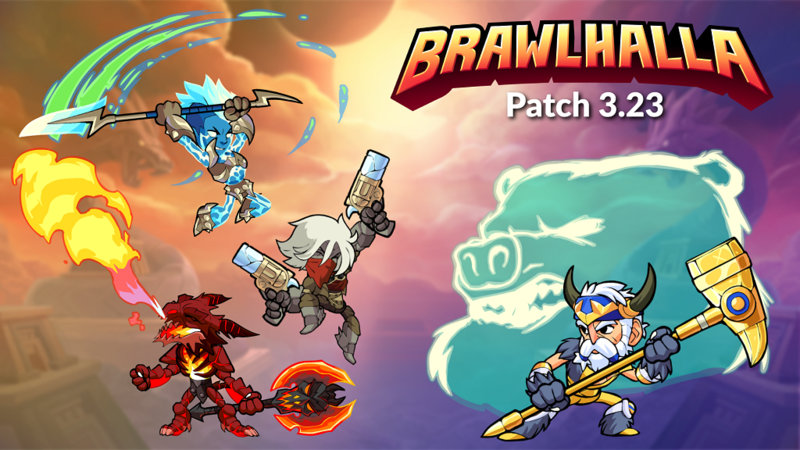 Brawl of the Week – Brawlball Bash! This week’s Brawl of the Week is Brawlball, where you and your team try to snag the ball and juke or pass past your opponents, so you can hold it in their goal to score! First team to score 3 wins! Goldforged color scheme now available under the ranked tab and can be purchased with Glory. Three exclusives skins in this limited-time chest: Stormlord Ada, Inferno Ragnir, and Dust Devil Cassidy. We also have new sale items, come check them out! Fixed an issue with Switch Controller Pro Controller for Mac. PS4 & Steam: The “Pick Up with Quick Attack” option for controllers has been moved into the controls screen. Steam: Players using the same type of controller are now able to have different custom bindings. When customizing controller controls, there is now a new “Apply & Save” button next to the “Apply” button. “Apply” will now only bind the custom controls to the current controller and will no longer save them or override the controls for any other controllers. “Save & Apply” will do the same as “Apply” but will also save those bindings as the default scheme for that controller (but will *not* override the controls for other players). Season 9 – Rewards and Soft Elo reset! If you’re new to Seasons, here’s some information you should know. You’re going to have a soft elo reset, and you’ll also receive Glory, the currency you receive for playing ranked. You can use it in the Ranked section of Mallhalla to get special colors and weapon skins to show your dedication to your favorite Legend. We hope you enjoy your rewards and enjoy the New Season! Note: Current Seasons for each platform are Season 9 (PC) and Season 4 (PS4). You can also use: http://www.brawlhalla.com/glory-calculator/ for a convenient estimate of what your Elo and Glory gained after reset will be. Ranked Avatars include prestigious versions for those who’ve placed in high ranks during previous seasons. For example, if you placed in Platinum last season and Gold this season you’ll receive the upgraded versions of the Competitor’s Badge and Gold Emblem. You will still have your original Platinum Emblem avatar from previous seasons. New Ranked Color Scheme – Goldforged! Beyond glory there is immortality! A new ranked color scheme has arrived! Goldforged color scheme is only purchasable with Glory and requires the Skyforged color scheme of that same Legend to have already been purchased. 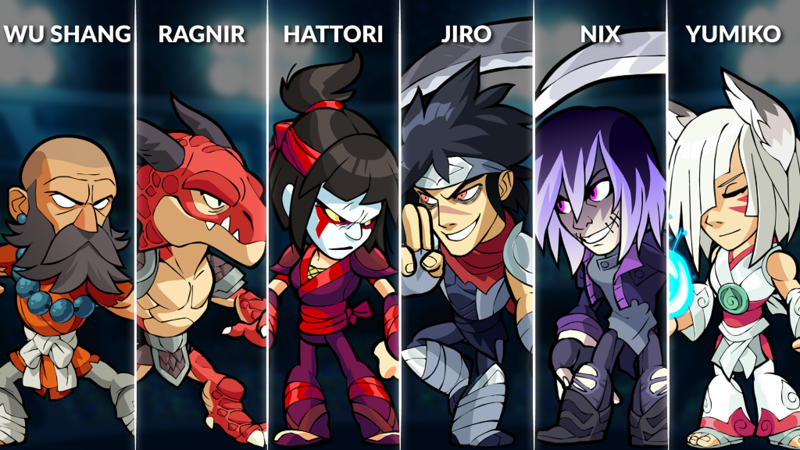 This week’s Legend rotation includes: Hattori, Yumiko, Wu Shang, Nix, Ragnir and Jiro. Hattori – A gifted ninja with unparalleled skill with the Sword and Spear has discovered Valhalla. Will she find any worthy challengers there? Wu Shang – Using the way of peace, discipline and martial arts, he takes down his foes with Spear and Gauntlets! Fixed an extremely rare bug, where a player could appear as the Random silhouette in practice mode while waiting for matchmaking.